للمسافرين الذين يرغبون أن يعيشوا كل ما تقدمه المدينة، Trinity Waters Boutique Beachfront Hotel هو الخيار الأمثل. يقع مركز المدينة المثير على بعد 25km فقط. يشكل هذا الفندق ملاذاَ مريحاً للاسترخاء ويمنح زواره فرصة للاستجمام والتجدد، وهو يقع على بعد خطوات من المعالم السياحية الكثيرة للمدينة. إن الخدمات التي يقدمها Trinity Waters Boutique Beachfront Hotel تضمن للنزلاء إقامة مريحة. يقدم هذا الفندق العديد من الخدمات الكفيلة بإرضاء أكثر الضيوف تطلباً. استمتع بوسائل الراحة الراقية في الغرف أثناء إقامتك هنا. بعض الغرف تتضمن تلفزيون بشاشة مسطحة, حمام إضافي, مرحاض إضافي, رف للملابس, قهوة فورية مجانية لمساعدتك على استعادة طاقتك بعد يوم طويل. إن حوض استحمام ساخن, حمام سباحة خارجي, غوص, صيد السمك, سبا هو المكان الأمثل في الفندق للاسترخاء وتفريغ طاقتك بعد نهار طويل. إن كنت تتطلع إلى إقامة مريحة وهادئة في المدينة، فستجد في Trinity Waters Boutique Beachfront Hotel بيتك الثاني. We had 2 units for 6 nights, when we arrived there was no access to the building we rang the number on the sign and was advised it was disconnected,an occupant entering the building advised we had to go up the road to obtain keys from another building/office, office closed ,rang contact number and advised keys in safe beside office. When we finally gained access to the units the 1 bedroom was OK, the 2 bedroom was very tired and needed an update,torn curtains,peeling paint in bathroom ceiling,exhaust fan not working in bathroom without a window,would not stay in this unit again,would stay in another unit as the building was in good position and well kept. great location ,very clean, stunning views, excellent for a family holiday. Really nice restaurants within walking distance from hotel. The staff were very relaxed and friendly giving the impression that nothing is too much trouble. Small pool but ok for small children. Nice and quiet and right across from the water. I stayed for three nights with my two young children and wish we could have stayed longer. 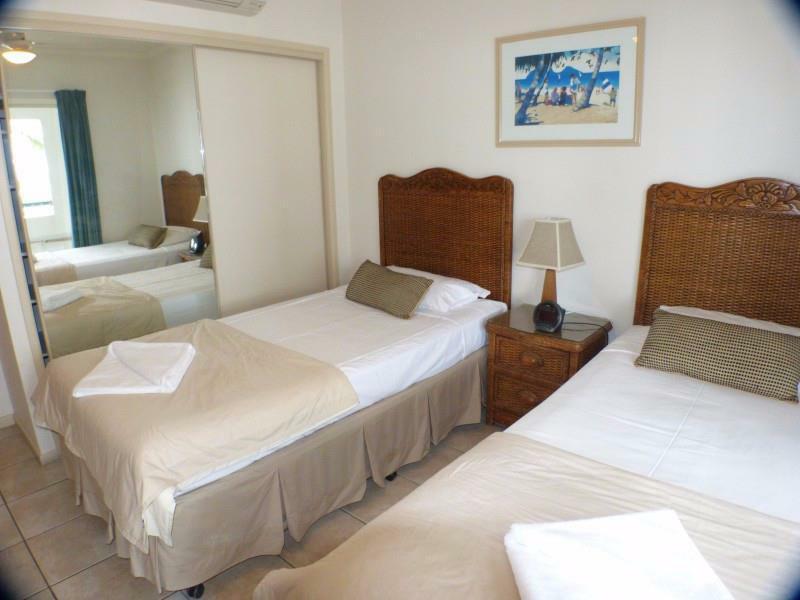 The two bedroom unit was clean and well equiped with everything we needed. Beachfront and superb service from Ian and Barb (on site mgrs. the onsite managers were so helpful and attentive to our needs. barb scheduled a car rental for us and had it delivered to the hotel. the beach front location was perfect and the view from our apartment was just beautiful.